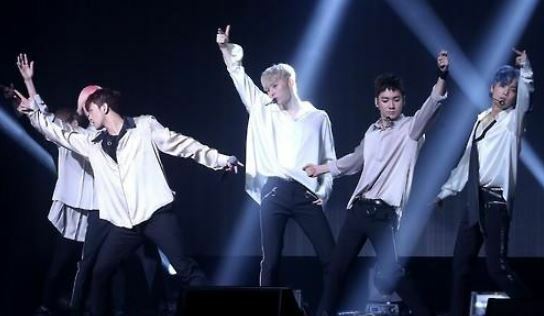 All members of NU’EST have renewed their contracts with Pledis Entertainment, which has managed the group for the past seven years, the agency announced Friday. The extension allowed the five-piece band -- consisting of JR, Aron, Baekho, Ren and Minhyun -- to remain intact. Most K-pop groups have an average lifespan of seven years. “We promise our utmost support for the group as well as individual activities,” Pledis Entertainment official said. NU’EST had been missing one of its members, Minhyun, as he had joined the project group Wanna One made up of the 11 finalists of the Mnet show “Produce 101 Season 2.” Minhyun was not allowed to take part in promotions outside of Wanna One from July 2017 to December 2018, so NU’EST had carried on its activities as the four-piece act NU’EST W.
Minhyun has returned to his original group after Wanna One disbanded.